As trainers and coaches, one of our biggest goals is to help our clients and athletes train at their highest possible level, without breaking down. You clean up their movement a little bit, teach them the basic movement patterns, and you’re off to the races. Unfortunately, many of our clients and athletes will always be fighting some sort of issue when they’re in the gym. Now some people are just predisposed to certain injuries – maybe due to a previous injury, their body alignment/position, or specific joint structures that are simply less than optimal. But rather than focusing on things we can’t control, let’s talk about things we can control – and that will, hopefully, keep your clients and athletes healthier over the long haul! Why do injuries happen in the gym? This is such a loaded question, I almost don’t know where to begin. So I’m going to make it really simple on for myself, and hopefully you as well! Imagine this scenario: You’ve decided you want to crank up your leg strength, so you’re going to do a squat specialization program. But let’s be even more specific here – you’re going to back squat every time you go in the gym. So for the next 3 months you go to the gym 3-4x per week, and every time you’re in there, you back squat. Nothing else – just back squat. At first there are no issues whatsoever. And for the first couple of weeks, you notice that you’re getting stronger. Your descent is smooth and controlled. And coming out of the hole is like a rocket blasting into space! It’s crazy, but it feels like every time you’re in the gym, the weights are moving faster and you’re feeling superhuman. But then, things start to take a nasty turn. When you wake up one day, your back is stiff and sore. A few days later, your hips are pissed off every time you move. And by the end of the training block, your knees feel like they’ve aged 5-10 years in the past 2-3 months. The easy answer is “overuse,” but that only leads to another question – why do certain areas of the body get overused, while others seem to be fine? What you’re seeing is a reduction in movement variability. When you lose movement variability, those little issues you have with regards to movement quality combined with a ton of training volume/intensity, will force you to overload certain areas of the body. Think of your movement on a continuum – on one side you have movement variability and health, and on the opposite side you have performance. If you want to get really good at something, like elite/specialist level good, what do you do? You do it as often as possible. If you’re a sprinter, you run fast whenever you can. 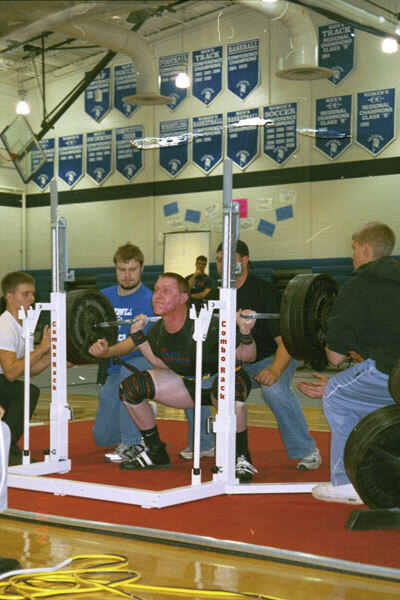 If you’re an Olympic lifter, you do the lifts as frequently as possible. If you want to become a concert level pianist, you practice the heck out of the piano every single day. Now when it comes to lifting, you might not be able to lift every single day (although some systems would argue this) – but, the more often you squat, the better you get at squatting. This is the method by the madness of programs like “Squat Everyday,” or many of the Eastern European and Russian powerlifting teams. It’s so friggin’ simple when you think about it – if you want to get really good at something, you do it as often as possible. And trust me, it definitely works. Just know and understand that when you specialize, you begin to limit and restrict movement options in an effort to improve performance. In the case of a squat, having too much freedom of movement actually takes away or limits performance! Have you ever seen how an elite-level powerlifter walks? Many often refer to it as the “duck walk,” because they’re externally rotated from the waist down. Too much hip rotation is extra range of motion they have to control – which takes away from their ability to perform and create output (i.e. squat) at a high level! Here’s an example: Normal humans should have 35-40 degrees of hip internal rotation. However, it’s not uncommon for the elite squatters we’ve evaluated at IFAST (guys that are squatting in excess of 900+ pounds) to have -10 degrees of hip IR when they walk in the door! In this case, we start to sacrifice health and movement variability in the name of performance. But let’s forget about you for a second, and talk instead about your clients and athletes. What if their goal isn’t to be a specialist in the weight room? What if, instead, their goal is to be a generalist? Like we said up top, specialization is cool if your clients and athletes want to break PR’s or World Records. But it may not be in their body’s best interest if they want to stay healthy and strong for a lifetime. So let’s circle back to the initial question: Why should we rotate exercises? Why should we rotate exercises? You constantly rotate exercises – and especially your main lifts – so your body doesn’t get too beat up. In our case, rotating exercises allows us to continue to develop strength/build muscle/lose body fat, without beating our body up by using the same exercises, day in and day out. But let’s dig a little bit deeper, and see why rotating exercises can help you and the people you coach. Many of our clients and athletes don’t want to be world record holding powerlifters or Olympic lifters. Instead, they want to build muscle. And have an appreciable level of strength and power developed. They don’t care so much about the specific lift that helps them be more awesome, they just want to be more awesome! So why would you keep pushing a barbell back squat on somebody who doesn’t necessarily need that lift? Maybe you could get the same outcome with a barbell front squat. Or a 2-KB front squat. Or a trap bar deadlift. Or a heavy kettlebell swing? Don’t get caught up in one exercise just because you love it. Find different ways to load the system, and that will ultimately allow you to build a well-developed and balanced human. Let’s say you’ve been front squatting hard and heavy for a while. You’ve been making awesome gainz, but the ol’ knees are starting to get a bit cranky and sore. Instead of taking out the squat all together, maybe you could switch to a very hip-dominant squatting variation, like a box squat. This will unload the knee joint to a degree, but still allow you to strengthen the overall squatting pattern. And even if some lifts are superior for certain goals, using them exclusively for extended periods of time could get you into trouble, if you haven’t maintained a requisite amount of movement variability. Movement compensation is NOT a bad thing. In fact, if you have clients or athletes that don’t compensate well, they’re probably a nightmare to train – because they’re always injured and hurt! While I definitely have my mental model of how I want someone to move, a lack of compensatory motion or movement variability can lead to a rapid breakdown. Let’s go back to our continuum above: On the right-hand side of the spectrum you have the most patterned and rigid powerlifter on the planet. If it’s not a barbell back squat, bench press, or deadlift, they’re into including it in their programing. Their specialization leads to a rigidity of their entire movement system, and over time, they start to lose freedom of movement (and the ability to compensate). On the left-hand side, you have the rank beginner that’s never done anything more than push a pencil, let alone a heavy squat or deadlift. The goal of most programs is to build enough rigidity in the system so that your clients and athletes can move respectable weights (helping them build muscle, burn fat, increase strength, etc.) but also maintain enough movement variability so they don’t break down. That statement alone pretty much sums up everything I do with my clients/athletes, so it’s probably worth reading a few times. #4 – To keep things fresh and fun! As trainers and coaches, we love the gym. Heck, it’s why we took a hobby and turned it into a career. But let’s be real here – for most of our clients and athletes, the gym is a conduit to something else. Improving their performance on the field, court or pitch. Looking great in (or out of) their clothes. So while we might be ok slogging away and do the same 5-10 exercises for our entire life, that doesn’t mean they want to. Rotating your exercise selection more frequently can keep training fresh and fun. Which in the end is never a bad thing! Hopefully by now I’ve convinced you that you need to rotate exercises from time-to-time. And this final section isn’t meant to be the be-all, end-all as it pertains to rotating exercises. Rather, my main goal is to give you some ideas that you can then take and extrapolate to your own unique situation. Trading a main lift for a main lift is my go-to option when it comes to rotating exercises. Trading a main for a main is great because it typically allows you to keep the intensity of the movement up, while rotating where the stress is placed. For example, if you’ve been front squatting and then rotate to a back squat or box squat, you can still move relatively heavy weights but now shift more of the load to the posterior chain. The same could be set for a sumo deadlift. While that movement will stress the quads and groin to a higher degree, if you switch that up to a trap bar or conventional deadlift, you’ll now put more emphasis and loading on the posterior chain instead. Trading a main lift for an accessory movement is my second option when it comes to rotating exercises. Trading a main for an accessory works well when the body is beat up and you want to decrease intensity and load. It also works well when you want to get out of the sagittal plane and restore movement variability. In this case, let’s say you’ve been pushing the squats and deadlifts hard, and as a result, the lower back is feeling beat-up. Instead of throwing in a different version of a squat or deadlift, you could really flip the script and throw in some single-leg or split-stance work instead. While I don’t like to use this option for extended periods of time, it definitely works well during deload weeks, or potentially for a specific training session when you just can’t make the magic happen. Trading a main lift for GPP work is, in my opinion, a last resort for rotating exercises. Trading a main for GPP work is kind often a last-ditch effort to keep training. If you have to do this it’s often because the body is feeling really beat up, and you want/need to give it a break from standard lifting. In this case, let’s say you’ve been squatting and deadlift hard lately. But it’s not just the training stress that’s getting to you. You’ve got major deadlines at work. Little Johnny is playing in 3 travel leagues and needs braces. You’re sleeping about 3.75 hours per night. In this case, training hard just may not be a stress that your body can handle right now. But rather than saying “Eff It” and doing nothing, you go to the gym and drag the sled, push the Prowler, and maybe do some sledgehammer work. Last but not least, if you’re looking to keep things fresh, progress/regress an exercise, or simply get out of the same stabilization pattern, consider trading an accessory for an accessory. Now there are so many option here, I’m not even going to pretend I can list them all here. But this is yet another way to rotate exercises, to keep the body adapting, and to keep training fun. So this one went a little bit longer than expected, so I’ll do my best to summarize well. Rotating your lifts is a crucial element of maintaining movement variability, which will keep you healthy and lifting at a high level for a long-time. There are numerous ways you can rotate your lifts as well. And while there’s a science to it (in the form of standard progressions/regressions), there’s also an art in knowing when to switch things up, and why it will help. But at the end of the day, if you want to keep your clients and athletes in the gym, healthy, and working hard, consider rotating your lifts a little bit more frequently. Always great information here. Thank you! !